Fiber Cable Accessories There are 9 products. LC female / SC female Simplex Fiber Optic Adapter, Singlemode / Multimode, Metal Hybrid Housing. Extend your LC/SC Fiber Optic Cables length without replacing the original fiber cable. Durable and compact, high performance hybrid fiber optical adapter design with low insertion and return loss. 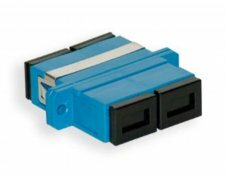 LC-LC Duplex Fiber Coupler for both Singlemode & Multimode applications. SC-SC Duplex Fiber Coupler for Singlemode and Multimode applications. Single Action System Fiber Optic cleaning pen for LC/MU 1.25 adapters and ferrules. This easy to use, one-click action pen will effectively clean a variety of contaminates with a simple push action. Just 1 click and you're all done. Works on APC & UPC fiber cable connections. Single action system SC Fiber Optic Cleaner with 2.5mm adapter cap for cleaning ST and FC mounted fiber connectors. This easy to use, one click action pen will effectively clean a variety of contaminates with a simple push action. Just 1 click and your fiber cable is clean. Works on APC & UPC fiber cable connections. ST-ST Duplex Fiber Coupler, Female to Female - Singlemode and Multimode for either Singlemode or Multimode applications.